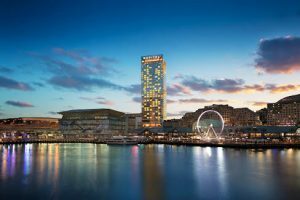 Less than a year since its opening, the Sofitel Sydney Darling Harbour has started collecting what looks set to be a long list of accolades that reflect the hard work and commitment that has gone into the launch of Sydney’s newest luxury waterfront hotel. Its most recent endorsements are from the Tourism Accommodation Australia (TAA) NSW Awards for Excellence, held on July 26th, where the Sofitel Sydney Darling Harbour was awarded Metropolitan Deluxe Hotel of the Year and Bar of the Year (Deluxe Hotels) for its Champagne Bar. In total, the hotel was a finalist across 18 categories at the prestigious TAA Awards including Restaurant of the Year (Deluxe Hotels) for Atelier by Sofitel and Conference and Events Venue of the Year. The much-anticipated Sofitel Sydney Darling Harbour opened its doors on 6 October, 2017, making it the first new-build, international luxury hotel to open in Sydney’s CBD in more than 15 years – the first since the city hosted the Olympics in 2000. Centrally located opposite the International Convention Centre, the launch of the 590-room Sofitel Sydney Darling Harbour in October 2017 involved one of the most comprehensive hotel launch strategies ever undertaken in Australia, including a gala charity event, major media and trade events, and a massive global and national promotional campaign to elevate the hotel and the Sofitel brand. In addition to the TAA Awards, the Sofitel Sydney Darling Harbour has won a spate of awards recently including: Best Hotel Architecture, Best Hotel Interiors, and Best New Hotel Construction and Design (Australia) from the Asia Pacific International Property Awards in May, an industry benchmark for exceptional achievement. Also in May, it was named Best Pool finalist in the annual Australian Gourmet Traveller magazine Hotel Guide 2018, followed with Best Business Hotel by SPICE Magazine in June, and Development of the Year by HotelsWorld in July. Sofitel Sydney Darling Harbour has also just been announced as finalist in an outstanding 12 categories in the upcoming HM Awards to be held on 7th September, including: New Hotel, Business Hotel, MICE Hotel and Hotel Restaurant (Atelier by Sofitel).